Handcrafted using the same techniques that were developed by Louis Comfort Tiffany in the early 1900s, this beautiful Jeweled Floor lamp contains hand-cut pieces of stained glass, each wrapped in fine copper foil. The Contemporary Tiffany design features a beautifully crafted base and a unique barrel-shaped neutral shade with jeweled accents. 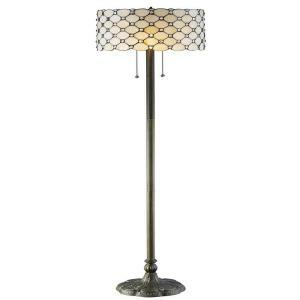 The Floor lamp boasts a classic and chic design and will bring brilliant elegance to your home decor. Tbook.com crawls the web to find the best prices and availability on Lamps and related Tools and Hardware products like Serena D'italia Tiffany Jeweled 60 inch Bronze Floor Lamp. For this page, related items include products we find that match the following keywords: "Lamp" at our vendor partner Home Depot. Serena D'italia Tiffany Jeweled 60 inch Bronze Floor Lamp is one of 143 Lamps and related products listed in the Tools and Hardware section of Tbook.com If you have any questions on this product, please give us a call at 734-971-1210 during the hours of 9am - 5pm EST for assistance. Thank you for shopping at Tbook.com, the Internet Department Store!